This October, we have gone turkey crazy. 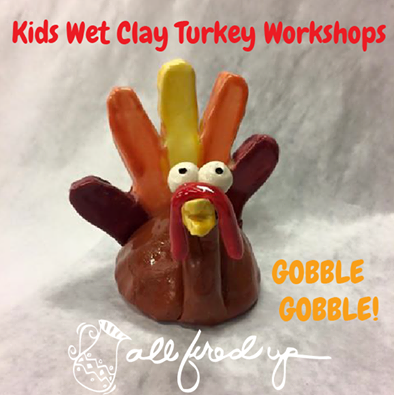 As an October exclusive, we have been holding Wet Clay Turkey Workshops. Join us to make a fantastic fall keepsake! Children will press their handprint in clay to create a holiday turkey. Great project for all ages. And now it’s the last week of October! So, only one week left to get in on all the fun. We have one workshop left. All ages are welcome to attend as long as there is a parent to assist! If you can’t find a date that works for you and your children, grab a couple friends, and we would be happy to set up a private class. Call our studio for details. Call to make a reservation today, only $20 per turkey! Drop off the kids with us as create a wet clay turkey, paint a ceramic pumpkin plate, AND enjoy a pizza dinner! The cost is $25 per child and is for ages 6 and up. Reservations are required and space is limited, so call and sign up today!